There is an established explanation for the low Carbon14/Carbon12 ratios since the industrial revolution. It follows the activity of the sun inversely. We have had an extended warming period during since the industrial revolution because the Sun has been very active. The way this works is not intuitive, and therefore it has escaped understanding until about ten to fifteen years ago. An active sun (measured by sunspots for the layman) also has an active magnetic field that extends past the Earth. This magnetic field shields the Earth from Cosmic rays that are basically high speed protons and neutrons released by violent events in space. Positively charged protons are deflected away by the sun’s active magnetic field. Cosmic rays are responsible for conversion of Carbon12 to heaver Carbon14 by the addition of two neutrons. Carbon 14 is unstable and loses those extra neutrons as alpha radiation, with a half life of about. The reduced proton cosmic rays then reduce the conversion of C12 to C14. It is this very mechanism that fooled the best climate scientists all over the world who thought the Sun had little effect because its radiance changes very little with sunspot activity. When the C14 and C13 curves were compared to the Sunspot curves, they were almost a perfect inverse match. More sunspots, less C14 and C13. Less sunspots, More C14 and C13. So, this shielding effect by the Sun’s magnetic field when the Sun is active prevents proton cosmic rays from reaching Earth. How Climate scientists were fooled is that they did not realize that an inactive Sun allows cosmic rays to hit the Earth;s atmosphere, and when they do, they stimulate water vapor to condense early and make clouds. Clouds are very reflective and send the Sun’s energy back out into space. This conversion of Water Vapor, the most important Greenhouse gas, responsible for 97% of the Earth’s atmospheric greenhouse effect….. into clouds, causes cooling. At any one time, the Earth is covered 62% to 70% with clouds. 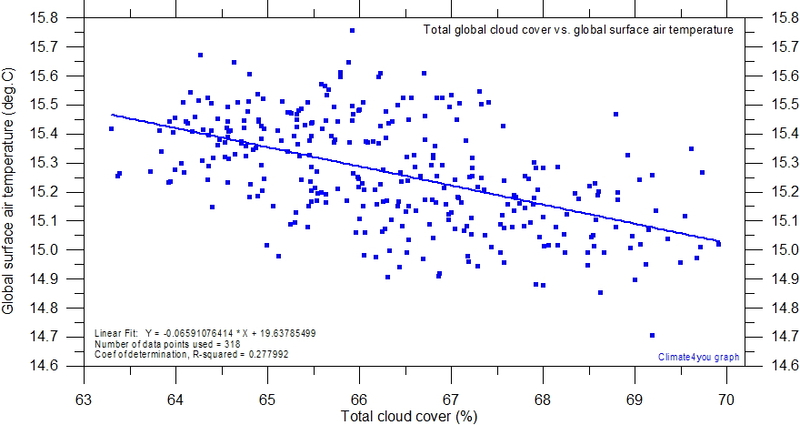 Variations in this global cloud cover varies the reflectivity of the Earth like a venetian blind. Basically, clouds cause cooling by reflection, and precipitation. Precipitation is a negative feedback function. As water vapor condenses, it releases heat. That heat gets radiated into space as well, leaving the condensed water as cool clouds and cool rain, causing further cooling. Unless the cloud cover moves out of the way so the water can absorb the Sun’s energy, is stays as water or snow or ice. If the clouds move out of the way, then the water absorbs the heat, evaporating. This has a cooling effect, but the heat is stored in the water vapor. This is another negative feedback effect. The combination of the two negative feedbacks keeps the system from runaway. The conversion of water vapor to clouds is the ultimate negative feedback, keeping water vapor from getting denser and denser by heating and evaporation. At some point, the Water Vapor condenses, releasing the heat as radiation into space, and forming clouds that shade it from the Sun. Thus, there is no additional heat from the Sun to be absorbed. This dual negative feedback is very effective in keeping an even temperature. With an inactive Sun, cosmic rays stimulate early condensation of the water vapor, releasing heat early and forming clouds early, exaggerating the cooling effect. It is this cooling effect that is deemed to be responsible for the lack of amplification for CO2 greenhouse effects, and for the lowered humidity we are seeing at higher altitudes. Water Vapor simply cannot hold as much heat and condenses when Cosmic Rays are abundant and the Sun is in a low activity mode. This is why the CO2 model never worked. The Sun fooled us into thinking it was only directly heating with a small variation in radiance. The indirect effect of the Sun is so huge, it even drowns out the Greenhouse effect. It does this because water vapor is convertible into water, snow and ice, with huge loss or gain of heat. This indirect effect of the Sun is so powerful that we are entering a deep cooling, based on historical periods when the Sun’s activity as measures by sunspots was very low. No matter what we say or do, we are cooling here on Earth, and it will be more and more obvious with each year as winters get longer and deeper. The Sun is now headed back down to nearly zero sunspot activity as it was four to five years ago. We are actually at a peak that is 50% lower than the peak in 2000, and that one was 30% lower than 1998. It is bad. We are going into a very cold period. It has already begun. The arctic ice extent has returned almost back to the normal mean, from the lowest period in 2012. It only took two years, 2013 and 2014. The cooling will accelerate as the current sunspot maximum dives down to zero again, as it was for about two years in 2009-2010. The sun’s poles are flipping. There is no reason to believe the Sun’s activity will rebound quickly, if it does at all for one or two normal cycles. There will be no warming until the flip is completed and gets established. It may take 20 to 40 years. We have been preparing for exactly the wrong thing because the CO2 climate model was trumped up with amplification that water vapor could never provide since it changes state into water, snow and ice and goes back again within the normal seasonal weather temperature ranges we have on Earth. One of these states is as clouds in the atmosphere, shading the area underneath and very effectively reflecting infrared back into space. Clouds, it turns out, are indirectly controlled by the Sun’s magnetic field that varies in cycles of about 20 years, with longer cycles of about 160 years and 210 years, and those longer cycles are having a coincident minimum right now. 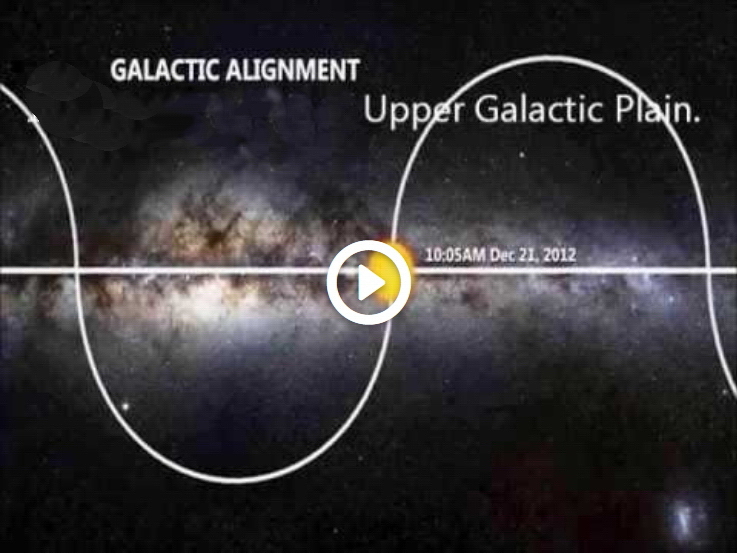 Earth’s inhabitants are not getting much notice. within the next two years, this dramatic dive in temperatures will be so obvious, another panic will set in. You see, Global Cooling is a mortal danger. Freezing temperatures kill. Cold short growing seasons prevent growing plants and animals for food. The predictions for Global Warming were bad, but the predictions for Global Cooling are far worse. Millions, perhaps Billions of humans could die if we cannot adapt. How can anyone talk about weather or climate changes while only talking of CO2 as the driving force? The SUN, WATER EVAPORATION, CLOUDS, Rain and Snow do it all instead. CO2 does nothing significant. The greenhouse gas effect of CO2 is just an interesting laboratory experiment. The idea that it could drive the Earth’s weather was an idea that has proven to be impossible. There is not enough CO2 in the Earth’s Atmosphere to make any difference in the weather. See Paullitely.com for clear details. Recent weather continues to get colder, not hotter. When will the media stop their conspiracy with well-meaning scientists who have sold out to reduce Fossil Fuel consumption? Will they apologize as we go deeper into the little ice age and it is obvious to all? Will we ever trust “Science” again? How many more of us will die from not being able to pay for fuel to heat and food to eat? British pensioners die by the thousands each year this way already. Cold weather kills. Cold weather prevents growing food. Global Warming is just not happening now. It has not happened as a consequence of CO2 EVER! 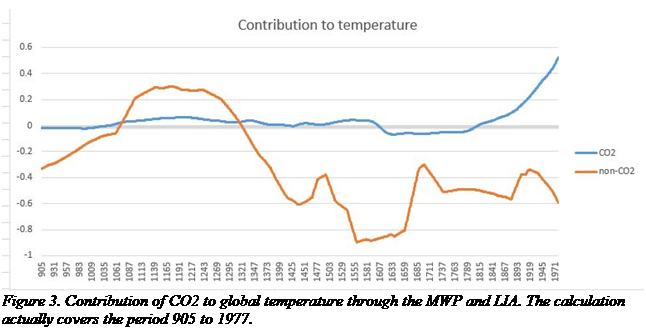 However, there have been periods when CO2 concentrations went up with global temperature, but it was not cause-and-effect. Instead, it was coincidence. Those who would influence people and nations to reduce their consumption of Fossil Fuels used this period of coincidence to say they had “Proven” that CO2 controls the Earth’s Weather. This is flatly untrue. The Earth has been cooling for the last 3,000 years while CO2 has been increasing for 7,000 years. Unfortunate for the GOP if they cave in to the Global Warming alarmists. 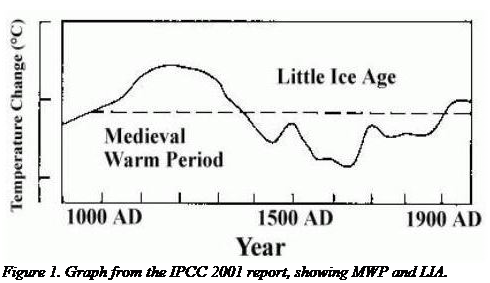 Then THEY TOO will be shown to be wrong in the next few years as the climate turns colder and colder in the “Landscheidt Minimum” little ice age. If they just adhere to their position, supported by real science, then they will be able to overturn the Democrats credibility as the charlatans they are on this topic. I have come to the conclusion that all these “Climate Actions” are ways to create a cash slush fund that the public has to swallow or be unresponsive to the shrill climate activists claims and statements. This applies from the very top at the UN, down through the countries to the states to the counties to the individual cities and beyond. What is being done now at the UN to get commitments from countries for 10+ Billion dollars, along with this article you brought up shows this. Fortunately, there is some rebellion, particularly by Austrailia, who is saying NO, we don’t have money to hire people to look for ways to make life more difficult and expensive, but we do have money to save the reefs and the rainforests by stopping them from being despoiled by illegal logging and dredging. Hopefully, the taxpayers, who have to pay for all these slush funds, will be asking questions about what they get for the $. So far, nothing has been done to change the weather, and the weather is fixing itself despite claims to the contrary. The more obvious this becomes, the more the public will call for a stop to the waste of their tax dollars, as is being done in Austrailia. The next few years will be colder and colder, making it undeniable that humans are not changing the weather as claimed by the beneficiaries of the slush funds. So many jobs and budgets depend on the sharade that it will not go quietly, that is for sure.